Avalon slot has been around for a while, and doesn’t seem to lose popularity. Even the sequel hasn’t managed to beat it, and that says something. It doesn’t have many bonus features or cutting-edge graphics, but what it does have - a fantastic round of free spins - is enough to make you keep coming back to it. Go collect some royal treasures. Avalon is one of the most popular slots from Microgaming, along with Thunderstruck and Immortal Romance. The game is rather old, and writing this Avalon slot review is a nice walk down memory lane for us. The special symbols are the only ones that remind you about the supposedly magical theme of the slot. Lady of the Lake symbols is scatter, that activated free spins; and Avalon symbol (a castle if the skies) is wild. The game layout is pretty standard - 5 reels and 20 paylines. Three or more scatter symbols trigger 12 free spins. On each winning spin a random multiplier is revealed (up to x7). In addition, the golden chest symbols becomes the second wild, and helps you form winning combinations more often. There’s also the gamble feature available after each win. Guess the color of the card correctly and you’ll double your win, or guess the suit to multiply it by 4. 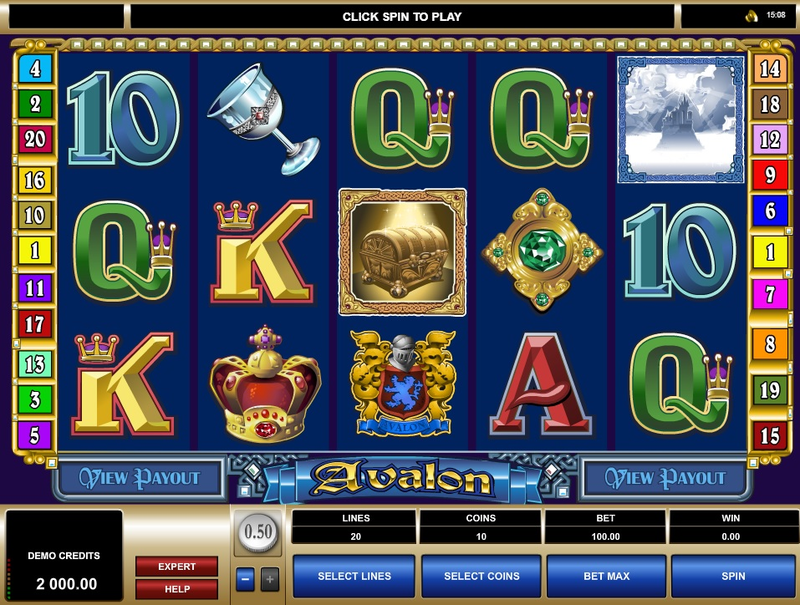 Avalon slot is a living classics. The graphics are simplistic by modern standards, but that’s understandable. More importantly, it offers a great round of free spins, with two wilds and a win multiplier. Click here to play Avalon - one of those pioneer video slots that have stood the test of time.